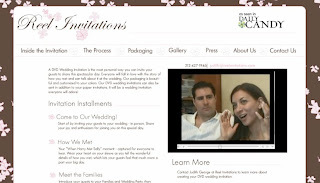 Potential clients needed to understand what a video wedding invitation was, and what components were included in an invitation. The client wanted to show samples of each component that were easy for the client to quickly play. Video Player Within Website: We installed a video player on the website so that potential clients could play segment samples from within the website. This way, ReelInvitations would not need to use Vimeo or YouTube to show clips. We built it to be user-friendly so that the client could switch it out herself.